“Memo to John McCain: Please, please READ THIS BOOK. It can help you win the election and guide Republicans in shaping the political future. In a provocative challenge to Republican conventional wisdom, two of the Right's rising young thinkers call upon the GOP to focus on the interests and needs of working-class voters. Grand New Party lays bare the failures of the conservative revolution and presents a detailed blueprint for building the next Republican majority. Blending history, analysis, and fresh, often controversial recommendations, Ross Douthat and Reihan Salam argue that it is time to move beyond the Reagan legacy and the mind-set of the current Republican power structure. In a concise examination of recent political trends, the authors show that the Democrats' cultural liberalism makes their party inherently hostile to the interests and values of the working class. But on a host of issues, today's Republican Party lacks a message that speaks to their economic aspirations. Grand New Party offers a new direction—a conservative vision of a limited-but-active government that tackles the threats to working-class prosperity and to the broader American Dream. 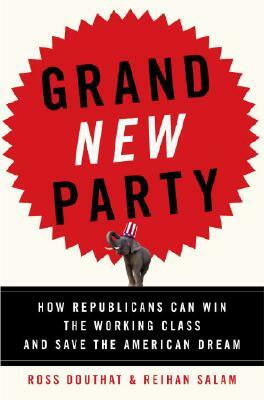 With specific proposals covering such hot-button topics as immigration, health care, and taxes, Grand New Party will shake up the Right, challenge the Left, and force both sides to confront and adapt to the changing political landscape.